The transition from karting to cars can be a very challenging task. 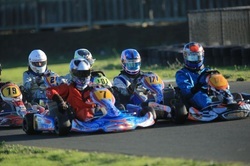 Karting is an excellent training ground and a particularly strong avenue for drivers to develop race craft and become acclimated to motorsports in general. Unfortunately, many of the driving techniques in some classes of karting can create poor habits that have to be corrected during the transition to cars. Attempting the transition from karting to cars without the proper tools and coaching can be costly and counterproductive. Much of the differences between karting and cars can be attributed to the masses and forces involved. The actions and reactions in a kart happen almost instantaneously, while depending on the type of car those actions can occur much, much more slowly. A driver’s reactions to the motions of the car need to be adjusted to compensate for the larger forces, masses and speeds of the bigger vehicle. EFM created the Karting to Cars program after working with several drivers that moved up the racing ladder too quickly and lacked the foundation they needed to succeed at the level they were racing at. Not only is it vastly more difficult to build that foundation at the higher levels of junior formula car racing, it is extremely expensive. Drivers were spending three or four years at a level that they should have only spent one or two years at, and their reputations suffered accordingly – not to mention their budgets. In order to avoid these pitfalls, EFM Racing created a professional level team of support that operates at truly entry level racing. Top level engineering, professional driver coaching, fitness and mental training and high end simulator work all combine to create an unparalleled level of support on track and off for a driver to jump start his career into cars. Add to this the best equipment and trackside personnel at this level in the country and you have all the tools you need to succeed to the best of your abilities.This allows a driver to gain the experience and skills needed for the solid foundation that will allow for much more immediate success as they move up the racing ladder towards a career in professional motorsports. At EFM Racing we have a comprehensive program designed to provide a driver complete support as they begin their auto racing career. We use professional level equipment and experienced, dedicated personnel combined with a curriculum that has been developed over many successful seasons. All of our K2C Factory Programs initially utilize the Formula Mazda race car, and have a primary focus on the west-coast based Formula Car Challenge racing series. Depending on a driver's needs and budgets, we will add testing and other club racing events (such as SCCA) to the schedule in order to provide the best environment for building a foundation of skills that will support a driver throughout their career. Graduates of the Formula Mazda may step up to the Pro Formula Mazda class of Formula Car Challenge before moving onto our graduate programs, but this is not always necessary and strictly a driver preference. In addition to full trackside support, engineering and coaching, we also provide fitness and nutrition programs, mental training and state of the art simulator training through our partners at Maher Solutions. As with our on track programs, the work we do away from the track has been honed over many years to produce outstanding results. EFM Racing limits participation in our factory racing program to one or two drivers each year in order to properly focus on these drivers' progress. We do provide comprehensive test programs in addition to our racing program, and regularly work with other drivers to develop their skills in a professional, well designed test environment. Smaller, more limited test programs are available for drivers wishing to try out the program, get a refresher after moving up, or for drivers with more experience. As each driver will have differing needs and budgets EFM Racing creates individualized schedules and curriculums to suit those needs. We are capable of expanding or contracting our programs in order to provide maximum value to each driver we work with. Some drivers will require more testing and training than others, some drivers will need more experience in a competitive environment to develop racecraft and gain a winning attitude, and some drivers will require more support away from the track to develop their physical and mental abilities to succeed. All of our race team and test clients begin their experience with EFM Racing with a thorough interview and examination of a driver’s goals and abilities.